Lucas Vicente-Cruz, 31, of Van Nuys, California, allegedly had 9 people in his van being trafficked from Houston to Georgia. Man Driving With 9 Immigrants Charged With Human Smuggling, SEVEN OAKS, June 9, 2015 - At approximately 5:30 pm on June 8, 2015, Trooper Zach Lenderman with the Texas Highway Patrol was on duty in the vicinity of Seven Oaks. Trooper Lenderman initiated a stop of a van that was speeding (70 in a 60 mph zone). The van was being driven by Lucas Vicente-Cruz, 31, of Van Nuys, California. Vicente-Cruz had nine passengers in his vehicle. When Lenderman requested identification, Vicente-Cruz provided a foreign identification that showed that his name was Javier Olivares Zepeda. However, upon further investigation, it was revealed that the foreign I.D. was false. Trooper Lenderman was quickly joined by Deputy Janie Cain with the Polk County Sheriff's Office. As it turns out, the nine passengers (7 men and 2 women) were being transported from Houston to Georgia and were being charged $300 apiece by Vicente-Cruz. The passengers were from El Salvador, Honduras, and Guatemala and originally entered the United States in McAllen. Vicente-Cruz was arrested and charged with human smuggling and may be facing other charges. Additionally, the nine passengers were detained and turned over to an immigration agent for interviews. Lucas Vicente-Cruz has a lengthy criminal history including arrests out of California, Nevada, Louisiana, and now Texas. Vicente-Cruz has also been deported five times from the United States. In March of 2015, a man was sentenced to 30 years in prison and a $10,000 fine for human trafficking. 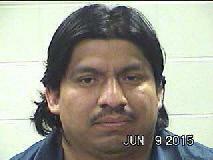 Vicente-Cruz had 9 passengers in his van (7 men and 2 women).